Bhubaneswar: Music for upcoming Odia film ‘Nijhum Ratira Sathi’ was released at a function held at Panthanivas here recently. The movie will hit the silver screens in the New Year. Malaya Mishra has composed music for the film directed by Sanjay Nayak. The movie has five beautiful songs with the situational tracks. Chandan Kar, Tamanna Vyas, Jyoti, Arun Mantri, Santosh Kumar Singh and other team members of the movie were present during the release of the audio. The crew expressed hope that the movie would do well in the market. They also shared an overview of the storyline of the film. “The film is set in a tribal village. Jyoti’s character faces a life-changing event, which shocks him to his core. When a police inspector, played by Chandan, tries to help him out, he finds himself stuck in the situation too. Tamanna, too, is playing an important character in the movie,” Sanjay said. 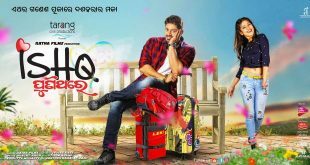 Besides, the lead characters, Kuna Tripathy and Biju Badajena are playing supporting roles in the film. The story has been written by Santosh Singh and the film is being produced under the banner of S.K.S and Laxmipuja Productions.